Patients who receive chemo or immune therapy at the Albert Schweitzer hospital can now easily consult all information about their treatment and share it with their loved ones, thanks to their own app. "As opposed to the thick folder patients are used to receiving, you always have the app with you" says internist-hematologist Eva de Jongh. “The app also refers directly to reliable external digital sources, and always contains the most current information. " 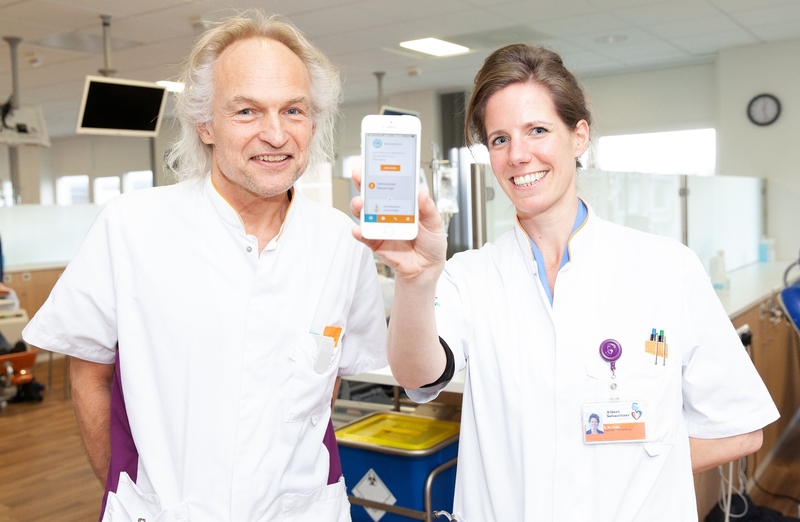 Internist-hematologist Eva de Jongh and hematology nurse Gerard Los are happy to provide an app that offers patients extra support in an already difficult time. The team at the Oncology department (where therapy is given), hope to provide patients with guidance and extra support in an already difficult time. The app also helps patients to discuss his or her situation more easily or to explain it to their colleagues and loved ones. The free app can be found by installing 'ASz Behandelpad 2.0' from the app store before going to the 'Cancer' section. The app also contains information about intensive Care, prostheses and lung cancer. All in all, the Albert Schweitzer hospital strives to offer an app for the convenience of all patients and their families who are treated at the hospital. The Albert Schweitzer Hospital is a general hospital in the Dutch province of South Holland, with locations in Dordrecht, Zwijndrecht and Sliedrecht. The name of the hospital is a tribute to doctor and missionary Albert Schweitzer.